My mother and I were cruising down by Missouri Drydocks at the end of the day, when I heard a train whistle off in the direction of downtown. I thought this might make a cool shot that tied together the river, auto traffic on the bridge and a train whizzing by. If a plane would just fly into the frame and someone would walk by, I’d have all forms of transportation covered in one photo. I waited several minutes. No train. It was chilly and windy so I started back to the car. The train whistled again. I waited several minutes. No train. I started back to the car. The train whistled. This dance continued until I convinced myself that the train was northbound away from me. Of course, as soon as I got under the bridge, I met a southbound short freight that had a caboose on it. I hadn’t seen a caboose on a working train in years. I wrote it off as a missed opportunity. I remember the trip to Chaffee in grade school. 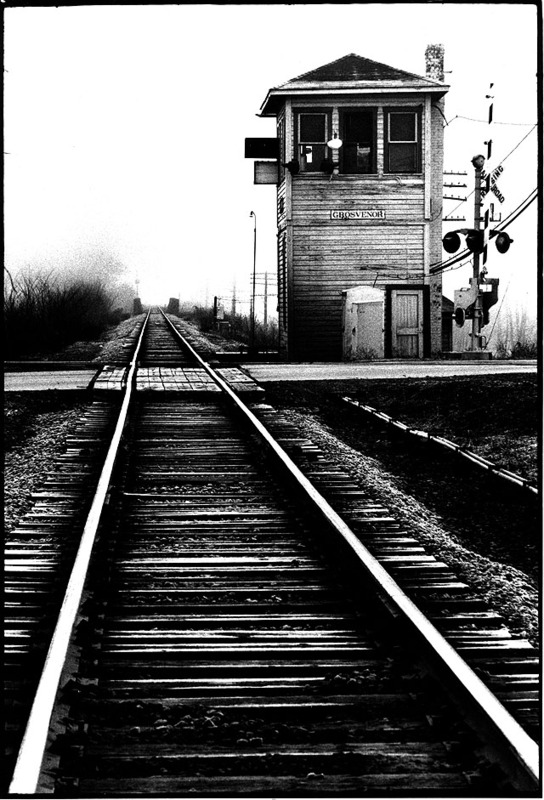 When I was 14, I went to Philmont Scout Ranch in New Mexico by train; I rode the train to and from college in Athens, Ohio; I did at least a dozen stories about trains over the years, and that doesn’t count the crashes and feature shots like this one from Ohio I used to illustrate a rail strike. The unbroken frost on the tracks got the point across that the trains weren’t running. I’ve done a story on a T&S Gang, the guys who used to swing sledge hammers driving spikes in the days before mechanization. Discrimination was alive and well: white workers ate on plates in a sparkling white car; black workers were served on tin plates in a car that looked like it was left over from the Civil War. I went from West Palm Beach to Chicago and back on the Silver Meteor; my wife and I took the train to and from Washington, D.C. in 2003. 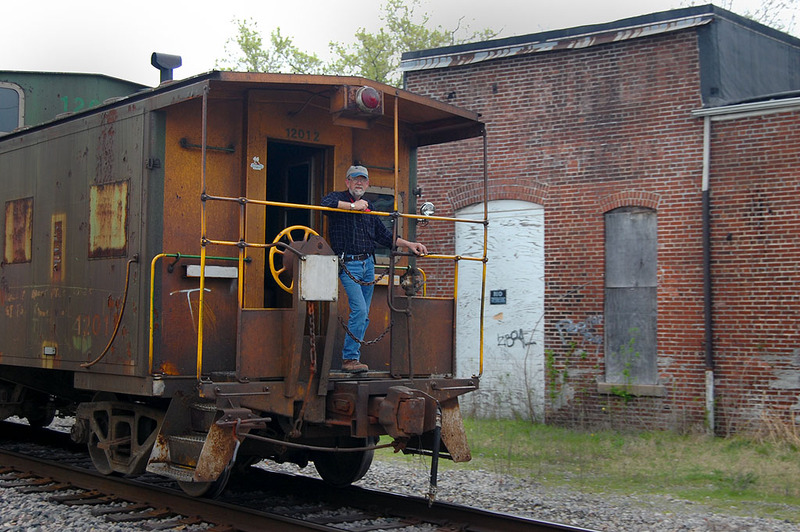 Unfortunately, many of the stories were “last ride” ones marking the demise of rail service. We were in the downtown area when I spotted the caboose on the north end of a northbound short string of freight cars moving slowly. I sped ahead to the pumping station on N. Main where the shoe factory used to be and hopped out to shoot from the floodwall side of the tracks toward an old brick building that looked like it had been abandoned. As the caboose pulled slowly past me, BNSF conductor Randy Graviett gave me a friendly wave. I’m going to show my age by admitting that I think Frisco when I see those tracks. It took a Google search to find out that BNSF stands for Burlington Northern Santa Fe. Over the last 150 years, it’s the result of mergers that have gobbled up 390 different railroad lines. Frisco, which was chartered as the Pacific Railroad of Missouri in 1849, looked like it was poised to take advantage of the discovery of gold at Sutter’s Mill in California, but construction bogged down until the Civil War ended. 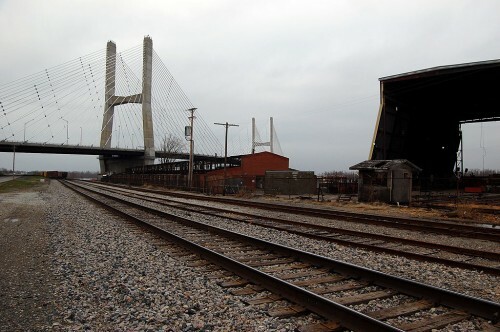 In 1876, the southwest branch of the Pacific was purchased by the St. Louis-San Francisco Railway, but Cherokee Indians blocked survey and construction work on the line, keeping it from establishing a transcontinental railroad. The Depression took its toll, but German U-boats sinking tankers in the Atlantic during World War II created a need for a way to transport Texas and Oklahoma oil to the East Coast. Frisco became a valuable contributor to the war effort. Burlington Northern acquired the Frisco in 1980. You can read more of the history at the BNSF web site. While I was waiting for the train to clear the track, I was treated to a moving art show of graffiti. These weren’t just sloppy “tags” with a spray can. Some of the works showed a nice use of color and design. No, the engineers don’t wave from the trains. Tom should pay a visit to Cape Girardeau. 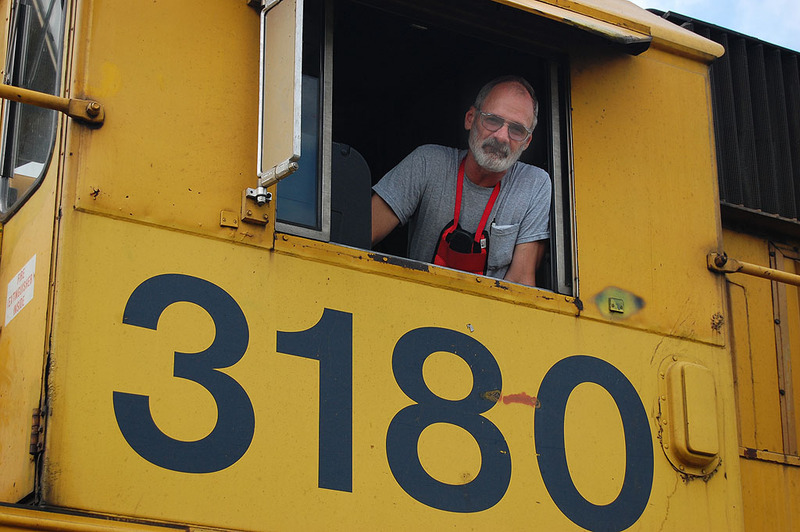 When the engine came to a stop just about in front of me, brakeman Randy Stroup gave a wave and asked if I was working on the floodwall. 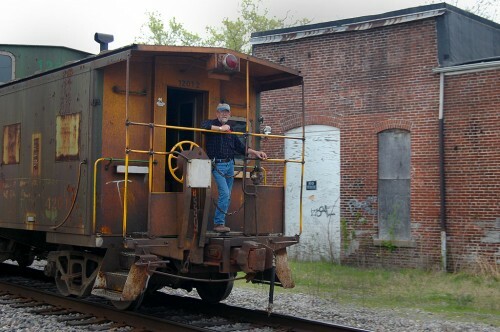 I said that I was taking pictures of his caboose and tried to hand him my business card. With that, the train was given clearance to pull ahead and he was gone. Wow. I wrote about the excitement of meeting a “reader in the wild” on my other blog. This is a first for me. I’ve never had a reader chase me down for a photo I shot BEFORE it was published. Cape is truly the land of coincidences. If you’re a train buff, interested in railroad history or want to find out more about the Frisco Railroad, here’s a great site. Ken, I grew up in Cape and I am in the process of building a model railroad based on the rail traffic in Cape Girardeau from 1950 to 1973. I really enjoyed your article and pictures. Randy, I believe is the brother of a friend of mine, Richard Graviett. Richard is a R/C Airplane flier I met back in 1983. Be sure to check out my layout plans and all the pictures from the Cape area I have posted on the frisco.org website. Keith, I don’t know if it’ll do you any good, but I have photos of a coal train on the siding at Cape Rock at this link. I also have an aerial shot of the riverfront here. There are tracks in the photo I took of the Scott City I-55 interchange, too. I’ll look out for train photos for you. 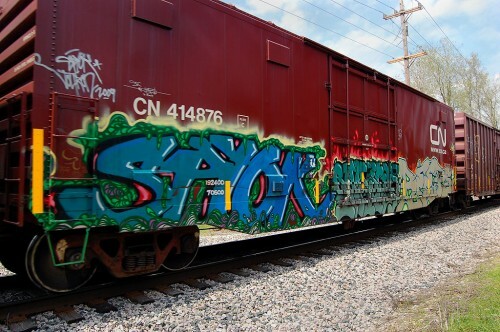 I did a quick Google search for “SAYOK” which is what I think the graffiti says on the train. I was hoping to find someone who goes by that tag who puts stuff online. It would have been neat to see where he/she originated and how far the train has traveled. Didn’t find anything. Previous PostPrevious Does Jessica Haunt Pike Lodge?